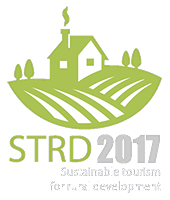 "Sustainable Tourism for Rural Development"
Rural Tourism is already an important part of the European tourism sector. But many assets and resources for recreation in rural areas are yet not used, or remain undetected. This conference is a step to broaden the view and unleash the full rural potential for leisure through a holistic approach that includes hospitality, food, gastronomy, culture, active tourism, and any other relevant aspects. Tourism represents around 10% of European GDP, and is one of the most resilient sectors of EU economy with excellent perspectives of growth. 92% of EU territory is rural or peri-urban, providing a wide scope of resources and public goods for 743 million habitants in Europe. 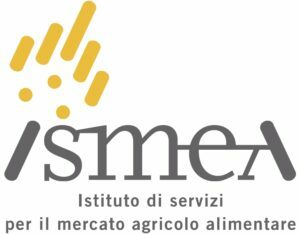 On Thursday 16th, each of the above is discussed in a moderated panel of experts and best practice cases from Europe and Italy. Further 40-50 examples will be presented in a Marketplace of Ideas in the foyer, where participants shall vote for the three most inspiring cases. On Friday 17th, the four topics are discussed in smaller work groups , while a fifth group will deal with possible joint projects. The results are presented at the closure session where also the winners of the contest from the Marketplace of Ideas shall be announced. The formal programme is complemented by social events and visit to the Cittá Alta of Bergamo. Participants at the Marketplace of Ideas have the opportunity to present their experience to the general public over the weekend at the AgroTravel & SlowTravel Exhibition. The organisation is shared between EuroGites-European Federation of Rural Tourism and MER-Mouvement Européen de Ruralité, in the context of the UNWTO “2017 Year of Sustainable Tourism for Development” and the implementation of the Cork 2.0 Declaration . It counts with support of the UNWTO-World Tourism Organisation, ENRD-European Network of Rural Development, COPA-COGECA, EDEN Network, Regione Lombardia, and Ente Fiera Promoberg, amongst others. Languages: simultaneous translation between Italian and English. French can be spoken only. Afternoon: set-up of panels for the Marketplace of Ideas at venue. Evening: reception of participants of the Conference. This fee includes the local transfers, congress participation, documentation, full social program and meals from Wednesday evening to Friday afternoon, guided tour to Bergamo Città Alta. Registered participants have free access to the fair “AgriTravel & SlowTravel Expo” that begins right after the end of our conference. This includes various opportunities for professional exchange (seminars, workshops, etc.) and business contacts B2B and B2C through a special match-making service of the fair. •	Cooperation of structures: CLLD/Leader, DMO, professional organisations, etc. The concept of image, expectations and experience: what does a visitor expect from a visit to the countryside? - how can we know these expectations, define segments, and then address and communicate with the actual and potential customer? Time to reflect and vote. Guided tour to the posters or cases related with topic 3. If you already made up your mind about your favourite idea at the Marketplace, this is the moment to vote. Digitalization is changing the concepts and channels for communication between providers and clients. It also offers new opportunities for long-term sales connections for local produce. How to make best use of this for organisation, management, development, and marketing of rural areas based on tourism and recreation? Coffee – Last occasion to vote! Work groups shall deal in more detail with core strategic aspects of sustainable tourism and rural development. Results should build on the discussions of the previous day, and focus on practical action to be implemented in the future. Each of them will be moderated by representatives from the partner organisations with most experience in the topic. Bus for visit to Città Alta. A full version of all documentation of the conference will be available for participants after the event, on-line (with password) and via USB (to be confirmed). No printed version confirmed, however, complete series of online documents will be registered with an ISBN code as an electronic publication (to be confirmed). The “Marketplace of Ideas” is an opportunity for innovative, out-of-the-box, or challenging initiatives on sustainable tourism in rural areas, from Italy, Europe, and the rest of the world to showcase their experience. We look for consolidated examples that work in reality, but do not exclude ongoing projects if they open new perspectives. Simply introduce your case online HERE , or fill in the following WORD form – we will contact you for technical details. 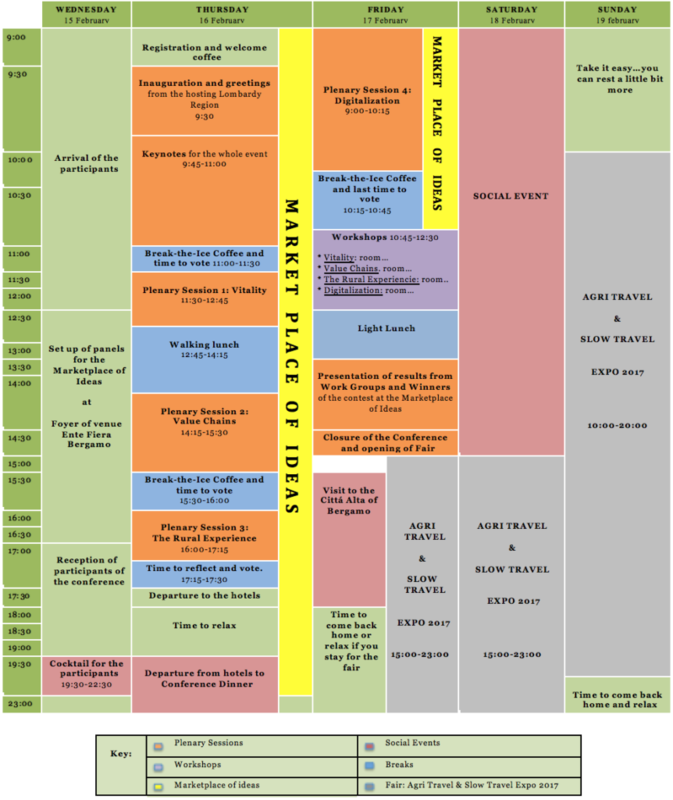 Cases exposed at this Marketplace of Ideas enjoy a reduced Conference Fee.They shall present their experience in the foyer of the conference with a 1x2mts poster displays provided free of cost. These displays will also be placed at the following B2C “AgriTravel & SlowTravel Expo” over the week-end, generating direct impact and possible clients in the future. A contest to be voted by the conference participants will select 3 cases that they consider most inspiring. Winners will be presented during the Conclusions of the conference, and receive refund of their participation cost (maximum 500 EUR). 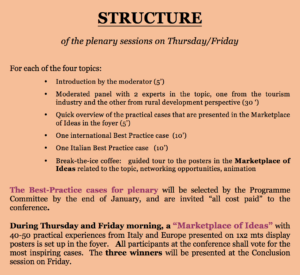 Selection by the Programme Committee of two comprehensive cases in each area (one from Italy, one from Europe) for plenary sessions on Thursday 16th. These selected cases will be invited “all cost paid”, but can NOT participate in the contest. Electronic-only presentation of cases (i.e. without participation at the Marketplace of Ideas) is possible, following a standard model (Powerpoint or PDF) which ensures a common structure, and therefore allows the confrontation of all cases based on the same criteria. These cases will be included only in the documentation and cannot participate in the contest. Additional to the practical cases, we welcome more comprehensive studies, essays, or articles. They will not be presented in the plenary sessions, but may be used in the WorkGroups on Friday morning, and will be also included in the conference documentation. Such papers can be sent directly to programme@strd2017.org They should comply with the usual requirements for scientific publications. In case of doubts, please contact the Programme Committee for more detailed technical specifications. Bergamo is a city of about 120.000 habitants, situated in centre of the region of Lombardia in the north of Italy. It is set at the foothills of the Alps that begin immediately north of the town. Due to its rich historic and cultural heritage, especially in the UpperTown (“Cittá Alta”) that is still surrounded by Venetian walls, it is the second-most visited city in Lombardia after Milan, which is only 40 kms away. A guided tour to Bergamo “Città Alta” is included in the registration fee. Bergamo “Il Caravaggio” (BGY) (4 kms) is the third-busiest airport in Italy and served by many low-cost airlines from all across Europe: RyanAir, Wizz Air, and BlueAir are the most important. Milano Malpensa (MXP) is served by all international regular airlines. Direct coach connection several times a day to Bergamo city centre (see HERE ). Milano Linate (LIN) is closer to Milan city centre, but no direct public transport to Bergamo is available (only via Milano Centrale railway station) – we discourage to use this airport. Transfer from and to Bergamo airport will be arranged for all registered participants free of charge. One free transfer from Milano Malpensa will also be organised in the later afternoon of Wednesday 15th-February. The exact schedules will be defined depending on arrival times of participants. Prices displayed here are available only for participants to the conference ‘Sustainable Tourism for Rural Development’ and visitors to the fair Agri Travel & Slow Travel. FREE SHUTTLE from city centre (Piazza Giacomo Matteotti e Stazione dei treni) to Fiera Bergamo will be available for registered participants.